Take a wild adventure into the vast unknown as you search for unfathomable riches and lost treasures. Click here to play! There is so much to discover that you won't want to leave this wonderful slot. 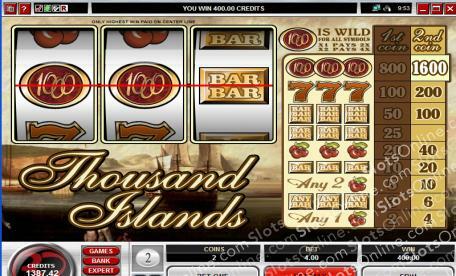 Thousand Islands is played across 3 reels and a single pay line, with two coin slots available for maximum payouts. The 1000 symbol is Wild and can be substituted for any other symbol on the reels to complete winning combinations. Additionally, a single 1000 symbol will double the payout, while two 1000 symbols will quadruple your entire winnings for that spin! The cherries and bars are plentiful, and they will payout remarkably well whenever you manage to spin up three-of-a-kind. A single coin play will still pay well, but if you are looking for huge winnings then play both coins for double the earnings on qualifying combos. Thousand Islands is an exciting slot that offers up to 1600 times your wager, so start your adventure today! The 1000 symbol is Wild and will not only multiply your winnings whenever it appears in combos, but can also substitute for any other symbol, and will payout up to 1600 times your stake.